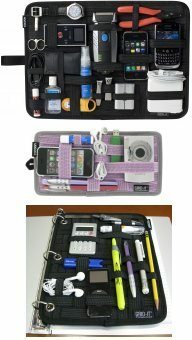 Organize your gadgets with GRID-IT! originally appeared on The Gadgeteer on July 21, 2010 at 1:00 pm. Let’s face it. Some of us gadgetophiles tend to be gadget collectors, even hoarders. No shame in that, but how do you organize it all, especially your EDC, daily commute or travel items? The GRID-IT! Organizer from Cocoon Innovations may be a good solution. It’s a rubberized woven elastic object retention system for gadget organization. It’s versatile, endlessly configurable and designed to hold items firmly in place. And the back of GRID-IT! doubles as a mousepad. There are multiple sizes to fit wherever you might want to organize, even car sun visor and 3-ring binder versions. Available in multiple colors and prices ranging from $9.99 to $29.99.